“I-Rish I Was in Dublin” promotion offers runners a chance to win a trip to the race; More than 30% of participants from last year’s race were from the U.S.
DUBLIN, Ireland – March 21, 2014 – Ireland’s natural Celtic charm will be on display at the 2nd annual Rock ‘n’ Roll Dublin Half Marathon on Monday, August 4. Last year’s inaugural event attracted runners from Ireland and abroad, with the U.S. making up the largest group of participants with 30% of the field coming from outside Ireland. To encourage runners to find their inner Irish at Rock ‘n’ Roll Dublin, the race is offering participants a chance to win a free trip to run at the event through the I-Rish I Was in Dublin promotion. Participants must register for the race with promo code IRISH before April 15 to be entered in the giveaway, or enter their email at Rock ‘n’ Roll Dublin if they were already registered. The “I-Rish I Was in Dublin” giveaway includes flights for two to Dublin (up to $1,000 per ticket), three-nights stay at the Hard Day’s Night Hotel, two Dublin Passes to explore the city’s best attractions and access to race day VIP amenities for two. Featuring live local bands positioned at every mile, the course offers a scenic tour of Dublin’s city centre, passing many famous landmarks. The race starts at the Docklands and concludes in Phoenix Park with a headlining performance at the finish line festival. Further course details to be announced soon. Visit rocknrolldublin.com for more information, and follow frequent updates on Twitter (@RnRDublinHalf) and Facebook (facebook.com/RnRDublin). 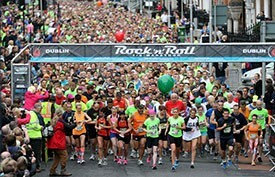 A Competitor Group event, the 2nd annual Rock ‘n’ Roll Dublin Half Marathon will return on the bank holiday Monday, 4 August 2014.The event will feature the best of local talent with live bands entertaining participants along every mile of the scenic course. The course starts in the heart of Dublin at the Docklands, runs along the River Liffey, travelling past many of the city’s historic landmarks, and finishing in the scenic Phoenix Park. The Dublin race is part of an international series of entertainment themed marathons and half-marathons, which revolutionized the running industry in 1998 by infusing the race course with live bands, cheer teams and entertaining water stations. Over the 17-year history of the Rock ‘n’ Roll Marathon Series, charity partners have raised nearly $300 million through the events for a variety of worthy causes. For more information about Rock ‘n’ Roll Dublin Half Marathon or to register for the event, visit rocknrolldublin.com or follow @RnRDublinHalfon Twitter.